Next up in my series on street foods is currywurst. Currywust is one of the most popular street foods in Berlin and is the German equivalent of a kebab or something from a chippie. It consists of a fried pork sausage sliced up into small pieces and covered with a somewhat spicy ketchup-based sauce. The sauce is what sets currywurst apart from other wurst dishes. It is usually made with ketchup or tomato paste with curry powder and other spices and seasonings. Currywurst is often served with french fries, but you can also get it with a roll. 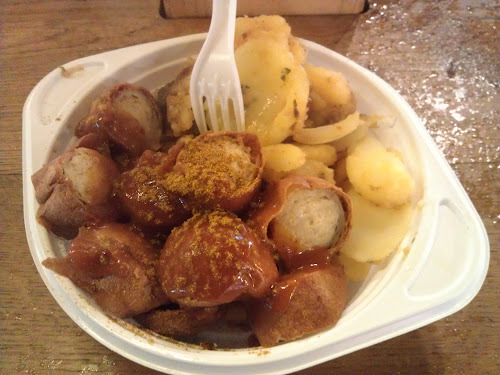 When I was in Berlin over Easter weekend, I tried currywurst with potatoes at the Ostermarkt in Alexanderplatz. I found currywust to be a nice change of pace from the more traditional German street foods, like bratwurst or pretzels.